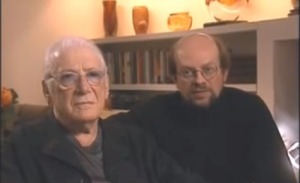 The loss of composer Jerry Goldsmith was, and is, incalculable. I did my best with this obituary for Variety but really tried to capture the breadth of the career and the immensity of its impact with this appreciation. And here, incidentally, is my two-hour Archive of American Television interview about Jerry’s long and distinguished career for the small screen. Jerry was kind enough to invite me to many of his scoring sessions in the 1990s and early 2000s, and every single one was memorable (even if the films were not). This entry was posted in Composers, Film Music, From the Files, Obituaries, Television Music and tagged Film Music Society, Jerry Goldsmith, Television Academy, Variety on August 2, 2004 by Jon Burlingame.